You want to be your baby’s favorite chef, don’t you? But sometimes changing diapers takes up most of your day, so there’s no time left for cooking. You know what that means? You need a to get yourself one of the baby food makers from the list below! Whip up fresh, tasty and healthy snacks that your baby will enjoy. What’s in it for you? Other than knowing what exactly your tiny one is eating, this God-sent device will save you time and energy. These devices are not a luxury; they’ve become an inevitable part of any household with a baby. Their convenience has probably convinced you of getting one by now, and we are here to help you choose the best one. The BEABA Babycook is ‘#goals’ in terms of quality, reliability, and efficiency. All those things you are supposed to take into consideration – BAEBA has put into perspective way ahead of you. Created for one-handed use, it comes with a compact countertop footprint and modern design. It offers steaming, pureeing, defrosting, and reheating of food. Everything about this device is BPA, lead, and phthalate free. Even though this baby food maker BEABA introduced to the market is somewhat on the pricier side, you will surely get value for your money. The BAEBA baby food maker takes only 13-15 minutes to steam the food, and the best part about it is that this model is extremely quiet. After the steaming is done, move the steamed food in the bottom bowl, press another button, and let the processing begin. The Cuisinart baby food maker and bottle warmer is another model worth mentioning. If your baby still hasn’t started eating solids like vegetables and fruit, you can use this system as a bottle warmer. Once your tiny one starts growing, you can use the same device for steaming and processing its food. The BFM-1000’s biggest advantage over other baby food makers is the fact that it comes with a four-cup bowl and is also very simple to use. When the steam turns off, turn the dial to “chop” and hold for a few seconds. In case of tough-to-blend vegetables like spinach, you might have to hold the button for a few seconds more. All in all, the Cuisinart baby food maker makes food steaming and processing look and feel like art. The best thing about the Lil’ Jumbl baby food maker is the opportunity to prepare two different purees at once. Other than that, this food maker can be used for steaming, blending, warming, and reheating; and on top of that – it can even sterilize bottles and pacifiers. You can choose from different blending modes which allow you to make anything from smooth purees to chunkier blends. Although this baby food maker comes mostly in plastic, worry not; the plastic is BPA free and dishwasher safe. It also features a display, as well as timing and safety options. We also thought we should mention that we have often seen this item at discounted prices at Walmart. The QOOC baby food maker is perfect for those who don’t like storing the food. It is a small-capacity device that fits perfectly in smaller kitchens, making it a great option for all of those who don’t make large batches of food. This model is a four-in-one food maker; meaning that – aside from the blending function – the steam function can be used for reheating and defrosting. Its capacity is about 300 grams. This baby food maker is similar to the BAEBA model, just in a smaller scale. It was designed for one-handed use, and all parts that are in touch with food are BPA, lead, and phthalates free. Another thing you are going to appreciate is the quiet motor when your baby is sleeping in your arms while you are preparing food. This next model has a decent capacity and doesn’t take up much space in the kitchen. This baby food maker is packed full of some fantastic features. For example, thanks to its ‘steam + blend’ function, you can make a puree with just one press of a button; and you can steam or blend separately as well. You are going to love the fact that the water reservoir is removable, as it will save you a lot of time and trouble on cleaning. The display on this model tells you the time when your food will be ready. If this isn’t enough, this Baby Brezza food maker comes with a glass bowl, which means there is a 100% guarantee that no harmful chemicals will get in touch with the food. The Kalorik baby food maker is also likely to find its place on your shopping list. Designed for one-handed use, it only takes a flip of a switch to start the whole process. This baby food maker is more than just a steamer and a blender; you can also use it for heating and defrosting food. It comes with a milk container, a measuring cup, and a soothers sterilizing stand for baby bottles and pacifiers. It is BPA and phthalate free, and it comes with a one-year warranty. This device comes in a 20-piece set. That means that you get not only the Baby Magic Bullet but also a bunch of handy accessories and storage containers. It is very simple to use; all you have to do is press the top to make a puree. While some greens will be easier to blend with water, there are some vegetables or fruit that can be blended without it. The best part about using this device is probably the fact that you can make an entire week’s worth baby food in just a few minutes. And thanks to the containers that come with this baby bullet, storing that food won’t be a problem at all. This baby food blender is very similar to the Baby Bullet device we mentioned above. However, it comes with one additional feature – a microwave steamer basket. You can also adjust the blender to make perfect purees, chunkier textures, or mini-meals, according to your weaning stages. 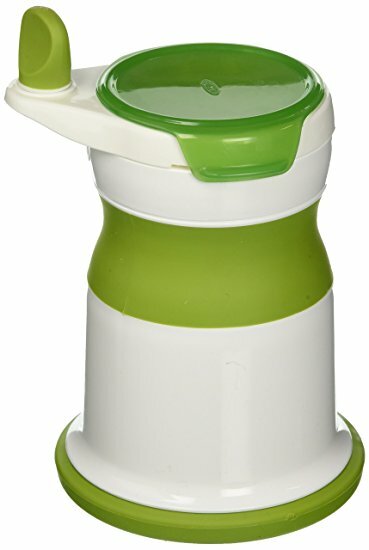 You can use this blender to make large quantities of food to store, or you can always use the small cup for quick meals. Although it already comes at an affordable price, Nuby’s baby food maker is often part of eBay’s deals and promotions. Cooking two meals at once is every parent’s dream. Thanks to the unique two-steamer-baskets system, you’ll save a lot of time once your baby can eat purees other than single-ingredient ones. It was designed to cook, blend, warm, or defrost the food, and it can also be used as a bottle warmer or sterilizer. Nutribaby is completely programmable and lets you know when your food is ready on the LCD. 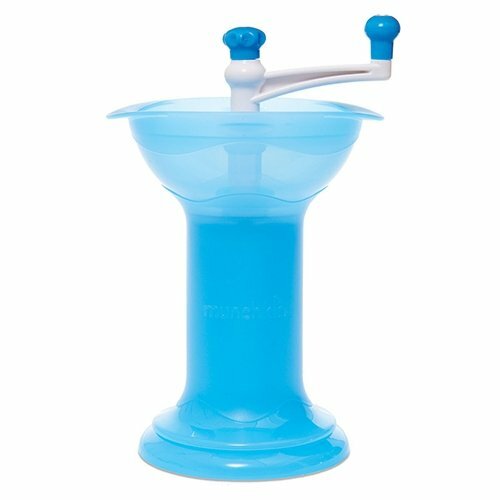 It has high blender capacity and comes with a large steaming bowl, while also being BPA and phthalate free. This is not your ordinary baby food maker, as it is here to satisfy not only your baby’s needs but yours too. 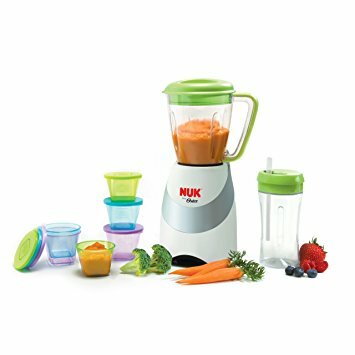 You can easily blend fresh baby food in the blender bowl or make smoothies for other members of your family, directly in the included sippy cup. This 20-piece set comes with stackable cups for storing food, and is made of durable tritan plastic to withstand the force of the 250-watt blender base. Finally a product your whole family can use. A baby food grinder is always a good idea. As soon as you can introduce more food choices in your baby’s diet, you should consider grinding the food. This energy-efficient tool does not need batteries or electricity. Aside from that, it is nitrosamine, BPA, Latex, PVC, and phthalate free. Portability is another plus since you can take it wherever you go. It comes at dimensions of 8.9 x 6.1 x 4.1 inches, so it doesn’t take up much space. The OXO Tot mash maker is basically a hand-cranked mill. It is very easy to use, and the outputs are unbelievable. Although it is designed for smaller portions – or immediate servings – your baby is going to enjoy the flawlessly smooth puree. It features a stainless steel blade and a grinding plate which help puree soft or cooked greens into tasty baby food. To improve stability, this mash maker comes with a non-skid base. Other than greens, you can turn any grown-up food into baby food, as it allows thickness control by adding water. This hand blender can puree a months’ worth of fresh baby food in just seconds. Although it is extra lightweight, it features a powerful, but incredibly silent motor that can easily blend vegetables, fruit, beans, meat, or poultry with no trouble at all. The convenience of the Immersion baby food maker knows no limits. It is BPA, lead, phthalate, and PVC free, and it is also very affordable. This multi-purpose device offers you thousands of possibilities. It can be used as a manual food processor, and it can deliver the best salsa, sauces, guacamole dishes, as well as chop fruits, vegetables, meats, all the while satisfying the demand of baby food supply. Yes, all that. Moreover, this system proves its efficiency in less than 5 minutes hence making it the perfect choice for those of you who appreciate the fact that this product uses zero energy power. All materials are BPA free, so you needn’t worry about the safety of the food. The NUK Mash can help you make fresh and healthy baby food. It is dishwasher and microwave safe, and also good to move around the kitchen. It has a simple design, and it is easy to clean, while also being one of the cheapest baby food makers available on the market. Once upon a time, baby food makers could only process food. That meant that you had to own a steamer to cook the vegetables or fruits first, and then process them in the processing device. Luckily, things have changed since these devices first appeared on the market in the 90s. Nowadays, they really do their name justice. Just stuff your baby’s favorite greens, add fresh water, and let your all-in-one baby food maker do its job. You only have to press a button before you’re free to play with that adorable little creature. When steaming is done, you’re again one button away from getting a puree. Congrats, you are now your baby’s Jamie Oliver, and all you had to do was press two buttons. Some of the newest models even come with a one-button feature. As a parent, you are probably too busy as it is. Do you really have the time to learn the science behind using something that is supposed to be a simple device? You don’t need a food maker that’s complicated to use. After all, you didn’t buy a space-shuttle. Choose a device that is user-friendly. If the user manual feels like you’re decoding Da Vinci’s Code – that is not what you’re looking for! Of course, the baby food makers we recommend you try are as easy to use as ABCs. Most of the latest technology releases focus on being highly reliable and come with great warranties. While it’s hard to find anything that is defect-free, the items on the below list are entirely reliable and have a customer satisfaction history. The best way you can protect your baby from eating harmful chemicals is to prepare the food yourself. However, some food makers come with plastic baskets and bowls which are associated with BPA and phthalates. Good news is that newer systems have solved this major problem. When it comes to efficiency, always look for both time and cost efficiency. You don’t want to end up buying a pricey food maker that only fits three cups. In the long run, a small bowl won’t save you much time. Instead, spend a few bucks more on one that comes with a bigger bowl. That way you can prepare several servings in one making. Also, pay attention to the motor power. Low motor power is a sign that you mustn’t miss; that food maker is not for you. The below list features only those devices with powerful motors. 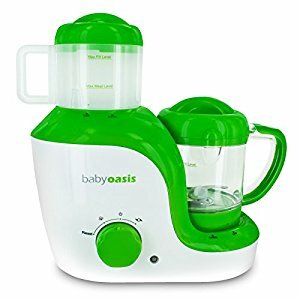 Since we already told you to look for a baby food maker that offers you the chance to make several servings at once, the question here is what to do with those extra portions. You can always store them in freezer-safe containers, so it is best that you opt for a baby food maker with storage accessories. The portability of baby food makers depends on their size and weight. The more compact your baby food maker is – the easier it is to place it wherever you want. These life-saving devices come at different prices. However, make sure to use your Amazon discounts on pricier items. Still, a costlier baby food maker does not necessarily mean a better one. That said, on the below list you will find high-quality baby food makers at affordable prices, as well as some items that you should try if you’re ready to splurge. Every single item on our list can easily bear the title ‘Best Baby Food Maker in 2017’. However, our goal when putting together this list was to narrow down the vast selection of them currently available on the market. 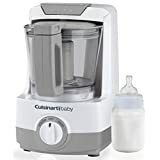 When reviewing these devices, our main focus was aimed at their importance in every household; so you can rest assured that you will be making the right decision by opting for any of the baby food makers above.